If you've ever ingested a poison, you've probably heard of Activated Charcoal or Activated Carbon. If you've not, count yourself lucky, as it's a horrible-tasting substance. However, it is wonderfully useful for a variety of purposes, and is something you should be aware of. 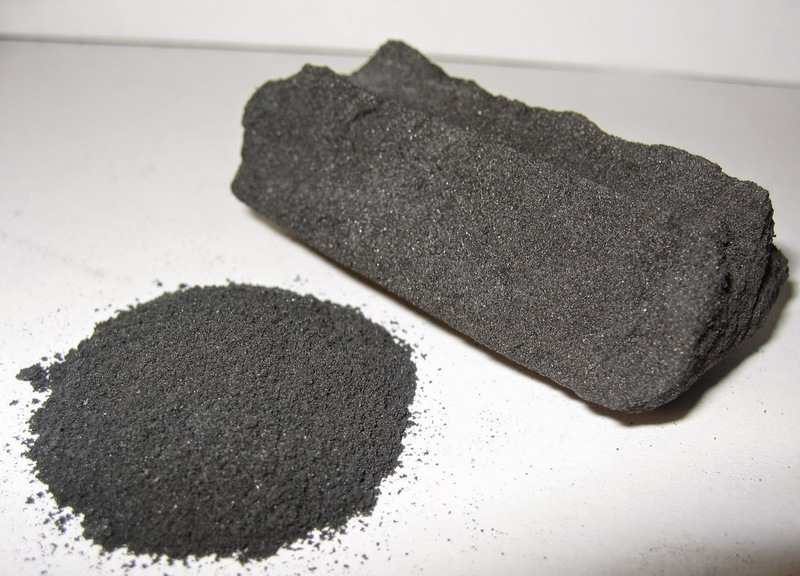 Activated charcoal is a form of carbon that has undergone chemical or physical processes that give it a large number of very small pores, effectively increasing its surface area. This process is so effective that one gram of activated charcoal can have a surface area of 500m^2. This makes for extreme adsorptive properties, where larger surface area directly relates to effectiveness. The process to make activated charcoal requires specialized equipment, so creating your own is beyond the capacities of most folks. It is, however, available fairly readily on the commercial market, depending upon your uses. "Activated Carbon" by Self (en:User:Ravedave). Activated charcoal is good for all manner of things. It has a number of scientific applications, and it can be used to form certain sound barriers. Doctors use it to treat poisonings (it adheres to toxins, neutralizing them) and it can be bought over the counter for this purpose, used per the directions on the package. My favorite use, and the primary purpose of this article, is filtration. Activated charcoal can pull all sorts of nasty contaminants out of any water you come across, and comprises a major component of a filtration system. A charcoal filter is quite effective, fairly simple to create, and can be made in any size you like. I personally helped install one in a 55 gallon drum, and I've seen them built in 250 gallon totes for industrial uses. For most folks' use and utility, a five gallon bucket will do. Either drill a hole in the bottom and put another bucket below it, or install a spigot on the side of the bucket, as low as possible. Line the bottom of your bucket with some manner of cloth. An old t-shirt will do wonderfully, as long as it's clean. Put in a layer of small pebbles, roughly 1/5 the depth of the bucket, followed by a layer of fine sand, about the same thickness. On top of the sand, put another cloth, then your layer of activated charcoal, covered by another layer of cloth. Repeat a sand layer, then a pebble layer, and your filter is ready. To use your filter, start by collecting the cleanest water you can find: Better starting water makes better output water. If your water is muddy or silty, let it settle some before you run it into the filter. Pouring it through a cloth into the filter helps pull large particles out as well. Once your water has been run through the filter, all of the sediments, particulates, and organic contaminants should be removed. However, bacteria, viruses, and other biological contaminants can remain, so further treatment is necessary. Boiling, distillation, bleach, or chemical treatment will remove those contaminants, and render your water entirely safe to drink. Water, water everywhere; just make it safe to drink. All gear shown in this series of articles is in a continual work-in-progress state. Please keep this in mind as you read, and also bear in mind that all gear shown is not top-of-the-line, "teh awesomes" expensive stuff. What I have is what I could afford, and I'm putting in the time and energy to either make it work or modify it enough to make it work. Got it? Okay, so I guess it's my turn to really start digging into my gear and showing y'all my setup. I'll start with my Level 3*, or Bug-Out Bag. You guys will recognize it from the article I did a few weeks ago when I had to do some repairs on it. That's right, it's my lovely trusty Teton 3400 Scout! It's a dual-task pack, because if that thing can stand up to the abuse I put it through hiking, it can survive as my bail-out bag. I've been doing a lot of work, with the help of my fiance DR, in getting it set up to be able to handle both tasks and do them efficiently. Now, my pack is divided up into several pockets. There are two on top of the pack, two on each side, the main compartment and a lower compartment that is a third the size of the big one. 1 emergency stove and fuel. This was the spare old stove DR had and gave to me. Never throw away still-usable equipment! I want to add a first aid kit. However I'm told that having three kits in total is excessive. For those of you who know how accident-prone I am in every day life: yes, really. I freaking love this really big waterproof bag. I have my spare clothes and current sleeping system in it, and should I need to put more things into the bag, they'll fit! It fits almost perfectly into the main compartment. various Evie-friendly MRE's entrees (Yeah, that's about 3 of everything that you can possibly find in MRE boxes) in a large ziplock bag. Yes, I said canned food. I have allergies, boys and girls; severe food allergies. This is why the gear in my pack seems so sparse: I have to have room for the cans. Things like the canned chicken and tuna are small enough to fit inside of my cooking pots there. A sleeping system outside of two small fleece blankets. I'm waiting for a system similar to the one DR has, which is a sleeping bag, a poncho liner, and one of those rainproof covers... yes, what the military uses. However, a lot of folks know how good those systems are, and finding a new or gently used set for a price I can afford right now.... well, let's just say I didn't skimp on the set of long johns! A sleeping pad. I have one, but it's in need of a patch as it got a small hole in it the last it was used. And that is that. It's ridiculously simple to many of you, I'm sure, but guess what? * In this context, Level 3 means "not as important as Levels 1 and 2." Think of my gear as layers; this is what I put on last. And before you say "Hey Evie, you forgot critical things like a can opener/ flashlight/ lighter/ etc", wait until you read the rest of the series. Odds are that the more important stuff is in Levels 1 and 2! Blue Collar Prepping Friday Flash! I have previously said that I am always looking for bargains. With my income reduced at the moment, deals are the only way for me to add to my supplies -- and boy do I have a deal! This is a Solio Xcellerator solar charger (with 2 AA batteries*) package that I found at the Concord, CA REI store. This is a close-out item that was regularly $29.93 -- but is now only $2.83! Stock is limited, so check your local store! A test is coming in my (not quite so) regular post on Wednesday. *The batteries are a bit unusual, but you will have to wait for Wednesday to find out more! The Bank building in Rock Ridge houses the only bank in town as well as the Telegraph office and the Post Office. I'll cover them in three different sections in today's post. Banks that operated more than a century ago had a different set of rules than we are used to in today's world. There was no FDIC (created 1933) to insure them against loss, no Federal Reserve (created 1913) to set interest rates, and no competition from Credit Unions (first one in the USA opened ca. 1908). Regulation from the State and Federal governments was minimal, mainly due to the lack of rapid communication and travel -- it is hard to audit a bank that is hundreds of miles away when it could take a week to get there and another week to get back to your office to file paperwork. Competition is now fierce, but back in the 1800s most towns only had one bank and it was enough. Most of us know how banks are supposed to work -- they safely store money for depositors, and loan that money out against collateral to borrowers who repay the loan with interest. Some of the interest on the loan goes to the depositors and the rest is used to operate the bank. The invention of fractional reserve lending (allowing the lending of multiples of the money the bank actually has on hand) and ETF (Electronic Transfer of Funds) drastically changed the way banks are run, as did the ever-widening ability for just about anyone to open a bank. Since we're apolitical here at Blue Collar Prepping, I will let you go about your business without having to hear my opinions concerning the banking industry as it operates today. Banks of the 1800's had a few problems. Since they were the main collection point of money in a town, they were the target of armed robbers (who weren't always successful). The vault or safe that they stored money in was large and heavy, making it expensive to ship in from a manufacturer. They generally relied on the vault door or safe for security after hours, although a large bank may have hired a night watchman and maybe a guard for the lobby during the day. Money in the forms that most people use for daily transactions was/is bulky, and shipping it was an invitation to robbery. They also had advantages over the banks of today. Without the regulations and rules, they were able to run with fewer staff and could pass the savings on to their customers. Most of the smaller banks were family run or operated and were part of their community, so they actually knew their customers. The trust of your community. Book-keeping skills and a way to record transactions. The skills to appraise collateral (or an appraiser on payroll). As the railroads marched west, they cleared a path for companies to set poles and string wires alongside the tracks. The railroads themselves installed many telegraph lines in order to be able to manage their schedules and fleets on the longer routes. Western Union (WU) is the name most people associate with the telegraph, but there were many smaller companies before 1851 when WU was founded and started buying up all of its competition. 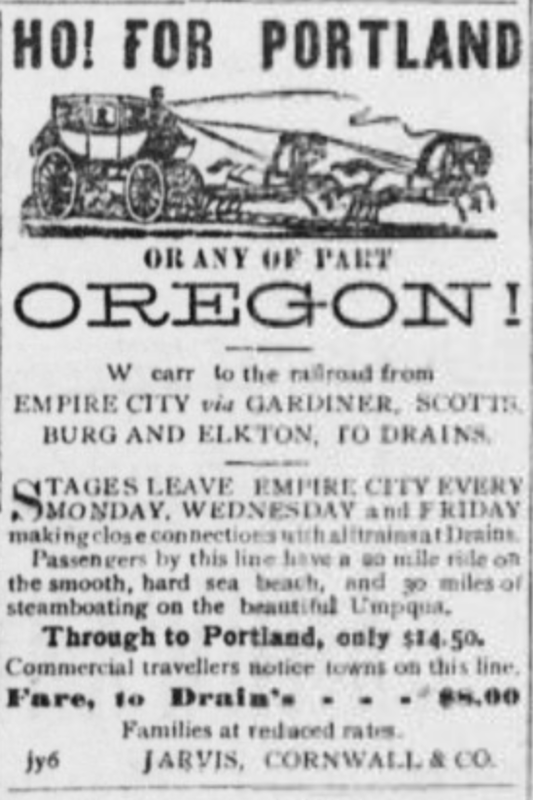 By 1861 the East Coast of the USA was connected to the West Coast by telegraph wires, only 11 years after London was connected to Paris by telegraph wires (1950). In 1871, WU started offering money transfers by way of telegraph, making it easier for people to travel without having to carry large amounts of cash (not a new idea, since the Knights Templar provided a "note" system for pilgrims traveling to the Holy Lands in the Middle Ages that filled the same purpose) as well as sending money to family in distant locations securely. The work of Robert Morse and his assistants gave us the Morse code, a simple method of rapidly transmitting information one letter at a time over long distances. Morse code used a simple switch, called a key, to send pulses of electricity through a wire to a relay. The original Morse design used a strip of paper fed through the contacts of the relay and when the relay closed, it would mark the paper. Operators quickly learned that they could understand the "clicks" of the relay better than the marks on the paper so they stopped using the paper strips. A beginner can send and receive Morse code at a rate of 5 words per minute (wpm), and there are still competitions where experts can push the rate up to 60 wpm. That's faster than a lot of us can type on a keyboard. Morse code is still used by ham radio operators, and still gets the job of transmitting information over long distances done. Morse code is taught as a language to be heard instead of as a method of sending individual letters. Users of Morse code don't hear the dots and dashes, they hear words and phrases- just like you don't see the individual letters I'm putting down here, you see the words that they form. Telegraph messages were not cheap. The sender usually paid to have his message sent, paying by the word, and the average message in the mid-1800s cost about a dollar. Remember, this was when gold cost $35 per ounce. Compare that to your cell phone bill! Many businesses and families worked out "codes" of their own to be able to send a message using as few words as possible in order to cut the cost of communicating. Most telegraph offices would have "runners", young boys who would deliver a (normally sealed) telegraph to locations in town for the tips they would get from the recipients. Setting up a more modern version of a telegraph office would be easy if you already have a ham radio set and have made contact with others in the area. Sending and receiving messages for others for a fee is frowned upon in the aftermath of a natural disaster (ham radio operators are usually the first to get information out after a tornado/hurricane/earthquake), but in a scenario where society has collapsed it might be a viable form of work. There should be no shortage of potential "runners" if the electricity is out for a long enough time. I know everyone has a story about the local Post Office, and rightly so. The US Postal Service has been carrying our mail since 1775. They were a federal agency up until 1971, when they were spun off as a private corporation, and are legally required to serve everyone equally regardless of location and at the same price. Being a government-run monopoly for almost 200 years kept the prices low and allowed them to set up a distribution network that dwarfs any of the current competition (except for e-mail). Slow, But Dependable has been the unofficial motto of the USPS for decades. There is a little-known service offered by the USPS called General Delivery: If you know someone is going to be in a town, but don't know when or where they'll be staying, you can send a letter to them marked "General Delivery" and the Postmaster will hold it until they come in and ask for it. Being able to sort and deliver a letter or small parcel across town is a job for a delivery man, but once you scale it up to the"territory" level it gets to be more complicated. Handing a kid a letter and a coin to have him deliver the letter to someone on the other side of town is simple. Once the letter has to change hands to get delivered, the problem of who pays whom arises. This is one of the few instances where having the government run a service can actually work, since the operation of a small-town Post Office can be subsidized by the income from the Post Offices in larger towns. Mail was carried from town to town in locked boxes on the stage coaches as they ran their routes, with the postmaster in each town holding the keys to the locks. This provided a basic level of security for the mail and avoided having dedicated mail coaches. Since the volume of mail grows with population, cities were served by rail cars custom-built for the USPS and attached to the regular trains going between cities. Setting up a delivery service after TEOTWAWKI would require knowledge of the people and places in your area, perhaps a form of transportation, and above all the trust of your customers. Networking with other delivery services would allow you to help serve a larger area, once you worked out how everyone involved split the fees. Those of us who served in the military before the invention of Skype know the feeling of hearing "Mail Call!" when physical mail was your only real link to family and friends far away. Do you have concerns about the availability of water during civil unrest? Are you worried about how you’ll get by if there’s a problem with the public water supply? Do you simply want to save some money every year on your water bill? Let me share with you how I’ve addressed all of those concerns, by setting up a rainwater collection system. First, let me start off by explaining that I recently had to have my gutters replaced, and along with that I spent a little extra to have covers put on the gutters. This means I never have to worry about tree leaves or pine needles (both a significant concern in my yard) blocking the gutters – or, for purposes of this discussion, getting into and contaminating my water supply. The instructions that come with the rain barrel are quite good, although there are a few key considerations that, should you choose to implement them, will make your life a little easier. 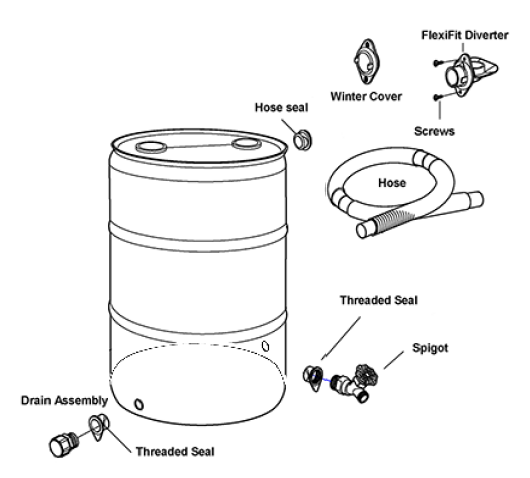 This diagram illustrates how I installed my first rain barrel, instead of the instructions that RainBarrelParts.com provides. Doing it this way means I can use almost ALL of the water in the rain barrel, not just 2/3rds, as would be the case if you assembled your rain barrel like RainBarrelParts.com suggests (in their example, the spigot is a third of the way up the side of the barrel, above the drain assembly). Another perk of this system is that it means my rain barrel is set up to be a cascaded rain barrel. If you want to add another rain barrel, you simply buy a hose to connect the two rain barrels (much like the same hose you would purchase for a clothes washer feed line), two more threaded seals, two more drain assemblies, and one more hose seal (if you used both of the ones in the original kit). Take the spigot out of the first rain barrel, and replace it with a drain assembly and a drain cap. In the new rain barrel, drill two more holes, just like how you did the drain and spigot on the first barrel. Into one of these holes goes the spigot you removed from barrel #1, and into the other one the drain assembly (but not the drain cap). Using the new hose you purchased, connect the two drain plugs in the backs of each rain barrel. Important Note: due to gravity, you’ll want to have the last rain barrel in the cascade set up to be lower in height than the one before it. Also, if you want to cascade multiple barrels, you’ll need a “Y” adapter for the back, to allow you to connect two hoses to the drain plug on any rain barrels that aren't first or last in the cascade. That’s it! You have doubled (or more!) 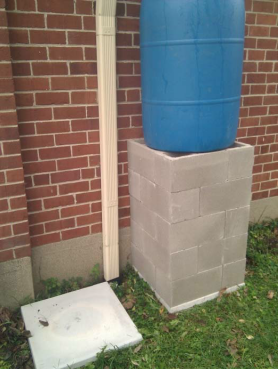 your rain barrel storage capacity. Now, you ask, what can I DO with this? In my case, I have yard-based gardens (some people grow flowers, some grow shrubs; I grow food I can eat) that are all positioned so that they’re lower than my rain barrels – which means I can use simple gravity-fed hoses to move water from my rain barrels to my gardens. I further simplify this by using quick disconnects on soaker hoses – when I want to water the gardens, I click a hose onto the soaker hose, and screw the other end of the hose into my rain barrel. You should always purify water that you intend to cook or drink before you use it. The simplest way to do this is to boil the water for a full minute for every thousand feet you are above sea level – which is to say, at least two minutes if you live in Ohio. This should remove most potentially harmful bacteria; however, it may not catch viruses. To address that, sterilization through various means is also a good idea. I use a Steripen that uses UV rays to disinfect water before drinking. Pill bottles? Seriously? Yup. Stone serious. I love preps with multiple uses, and I love cheap/free stuff. This is well documented. 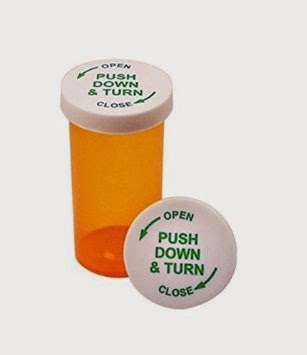 The common prescription pill bottle hits both of these criteria wonderfully. Pill bottles are super light, free (after you pay for the meds in them, of course) and water-tight. I hesitate to declare them waterproof, because they may leak at some point, but in all my testing, I've yet to have leaks develop. All of these notions are based on the default clear amber bottle, roughly 1" in diameter, but some of the larger bottles can open up even more interesting possibilities. Tinder container: I've already shown that I carry my tinder in pill bottles, tightly compressed. When I pull it out of the bottle, you'll be stunned by how much I can fit in there, and how many fires it will start. Kept in the bottle, my tinder remains completely dry for when I need it most. Match Case: The same dryness that protects and preserves your tinder will do the same for strike-anywhere matches. If you glue a small square of the striker material to the inside of the lid, you'll also have a ready surface to ignite your matches against. Emergency fishing kit: Wrap fishing line around the outside of the bottle, and secure it with a pass of duct tape. Put a selection of hooks, weights, swivels, and possibly a lure or two inside the bottle. It's not pretty, but it's far better than nothing, and with good lure selection and a bit of practice, can catch fish quite effectively. Put a small piece of cork or foam rubber on the barbs of your hooks to protect them and to prevent a sharp metal snag from appearing inside your kit. Sewing/patch kit: A couple needles and pins, a couple squares of cloth common to your clothing (mostly denim for me, but other wardrobes obviously differ), and a yard or two of thread in a couple common colors, and suddenly a snag or split is an inconvenience instead of a potential crisis. Add in a small selection of buttons if you have some available and wear clothes that button up. If you wrap the thread around the index and middle finger of one hand, it will fit neatly and smoothly into the kit. Change holder: There are still pay phones out there (Google it, kids), and they still require change. In addition, a spare $10 or $20 folded up alongside can come in very handy when you're in need. Jewelry/"Stuff" holder: My wife swears by small bottles to hold her earrings, rings, and other small accessories when camping. 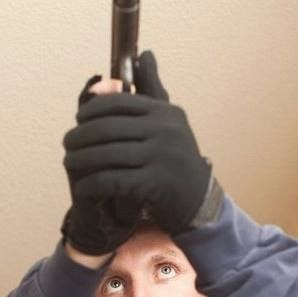 I keep my ear protection for shooting in one. So, what's in your bottles? 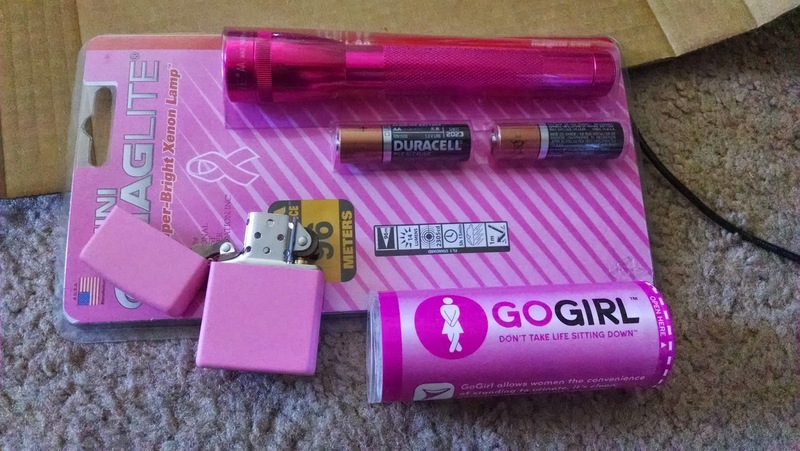 Last week's article ended up in me getting a pink flashlight and zippo lighter. For those of you who missed it, a discussion on our Facebook page about what my OHED kit was missing turned into a rather good-nature tormenting of yours truly, spearheaded by my co-blogger and adopted sister, Erin. Erin says: Guilty as charged. I called it "Operation Pinkbomb" because the funniest way to shore up the holes in Evie's OHED was by getting her the girliest, pinkest items possible -- mainly because her cries of torment are so cute. She detests pink, y'see, but isn't in a position to turn down free gear. Erin included something that I found myself incredibly intriguing and rather eagerly agreed to test it out and review it. This is the first time I've reviewed something that I've been disappointed in. So here we go. A review of the Go Girl female urination device. It's this little device that has the tag line "Don't take life sitting down." My tag line addition: Don't bother buying. I want to emphasize that the only thing that changes between using this device and just squatting/sitting is just that: you are standing. THAT'S IT! "While standing, hold the Go Girl against your body to form a seal. Press with your thumb and middle finger stretching from front to back." Let's get something straight here: you can't do that through your zipper. You do the same amount of work in pulling your pants down or your skirt up. Women's underwear doesn't have a fly, so that has to come down too. You still have to wipe yourself clean (women can't shake themselves dry like men can), and you can't do that through a zipper. If you are menstruating and don't use tampons, it's...grossly messy and you will just end getting fluids all over the insides of your legs and on your clothing. You are NOT saving yourself any work. You are NOT giving yourself any more privacy. Honestly, this thing feels like a high school girl's response to being teased by boys about having to sit down to pee. "Surely there are some good things about this, Evie?" You have to urinate into a bottle because you're in a tent, on a road trip and the driver won't stop, etc. The toilet seat is highly questionable. These are the only two things I can think of where the Go Girl would give you even a small advantage. That's an incredibly small niche. It's a novel idea, but... well... it's not practical in my world. FCC Disclaimer: This product was bought for Evelyn as a gift, and she didn't give it a positive review. Please go away and look for some real crimes. & is used with permission. Last week, I reported that a coronal mass ejection (CME) hit the Earth. Fortunately for us, the resulting geomagnetic storm never went above G3 intensity, and the only effect I noticed was increased interference when talking to friends who used wi-fi to connect to a Google Hangout. On this week's Gun Blog Variety Cast, I talk about the many uses a 5-gallon food-grade bucket has, and how you can get one for little to no money. Today's post is an intersection of these two ideas, as I will be teaching you how to make a Faraday Cage -- something that will shield your delicate electronics from stronger EMP sources (like a G5 intensity storm) -- using the aforementioned bucket and common household items. Special thanks to Chaplain Tim, Lokidude, and Scott Bascomb for helping me with this. 5-gallon plastic bucket. It doesn't need to be food grade -- save those for other uses! A new roll of aluminum foil. In this case, the larger the roll the better. Rubbermaid or Tupperware boxes. Alternately, newspaper and spray-on Plasti-dip. An extension cord you don't mind cutting up. A hose clamp (or, in a pinch, electrical tape). A copper rod several feet long and a soft patch of earth, OR a cold water pipe made from copper or iron. Ensure that your bucket is clean. Measure the distance along the interior of the bucket from the bottom to the lip, and write it down. (We will call this measurement A). Measure the distance across the interior bottom of the bucket, and write it down. (We will call this measurement B). Create the following formula: L=(2A+B)+2. This will give you a length, L, that goes down the inside of the bucket, across the bottom, and up the other side, with an additional inch sticking out on either end. Measure and cut at least 5 sheets of aluminum foil to length L.
Apply spray adhesive to sheets (sparingly, and in stripes) and then glue them together. Iron out any air pockets you find! The layers of foil MUST be as flat as possible. When the last layer has been laid and glue sprayed onto it, place the foil inside the bucket and smooth it out. REMEMBER: No air gaps within the foil. REMEMBER: Leave an inch of foil on either side of the lip. Repeat steps 5-10 to that all sides of the bucket's interior are lined. IMPORTANT: No plastic should be visible on the inside! Why are we doing it this way? The idea is to make an easily portable and durable shelter for electronics. If the foil is on the outside, it will be vulnerable to tearing. This method takes more time to set up but leaves you with a more rugged Faraday cage. Why not use a galvanized steel trash can?Because steel doesn't conduct electricity as well as aluminum, and the idea is to create a path for the EMP around the electronics. Measure the diameter (distance across) the bucket lid. Glue the sheets together as described above. Glue the sheets to the inside of the lid, making sure that the foil covers any gasket the lid may have. Place any items you want protected inside sealable plastic containers, like those made by Tupperware or Rubbermaid. Items which cannot fit inside plastic containers may instead be wrapped in newspaper and then sealed with the spray-on Plasti-dip. Make Sure all bits of newspaper are covered in a plastic shell. IMPORTANT: At no point should any electronics be in contact with the foil! Always make sure there is a thick layer of insulating plastic between the foil and the electronic device. Carefully place the lid on the bucket and seal it without damaging the layers of foil. The extra inch of foil extending past the bucket's lips needs to make firm contact with the foil along the inside of the lid. Take your extension cord and cut the plug off each end. Strip the plastic off to expose at least one inch of wiring. NOTE: extension cords have between 2 and 3 wires per cord -- strip and expose ALL of them. Take one end of the cord and glue or duct tape the stripped leads to the foil. An ideal location for this is one of the surplus corners from the lid. Wrap this end up tight. You do not want it to come loose! If you intend to ground your cage outside, take your length of copper outside and hammer it into the ground as deep as possible. If you intend to ground your cage to a cold water pipe, take your bucket over to the pipe. You may need to scrape the pipe to remove any rust, paint, or corrosion. at the place where you want the grounding to take place. Secure the other stripped leads to the pipe or rod with a hose clamp or more duct tape. Buy a second extension cord. Plug first cord into second. Cut ends off as per above. When storm has passed, unplug extension cords from each other. Take bucket inside (or wherever you keep it). Your home-made Faraday cage is now complete! 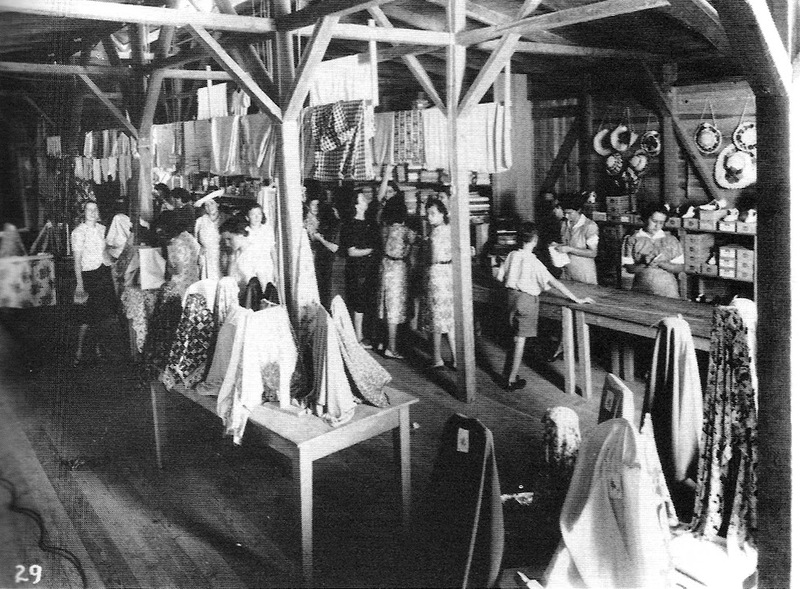 Dry goods shipped in from other towns and bulk purchases of daily needs were to be found at the general store. Since electricity wasn't common outside of large towns and cities, the general stores usually had tall ceilings with shelves all of the way up in order to pack as much as possible into a small footprint (easier to heat and light). Ladders on tracks were commonly used to let the shopkeeper get to any stock stored on those high shelves -- keeping expensive and fragile things off the floor made sense in the often-crowded aisles in order to minimize theft and accidents. Tall windows were needed to let in as much daylight as possible, and also served as a way to display the store's selection of goods. However, glass was expensive to have shipped in, so most of the counters were wood with perhaps a glass front. 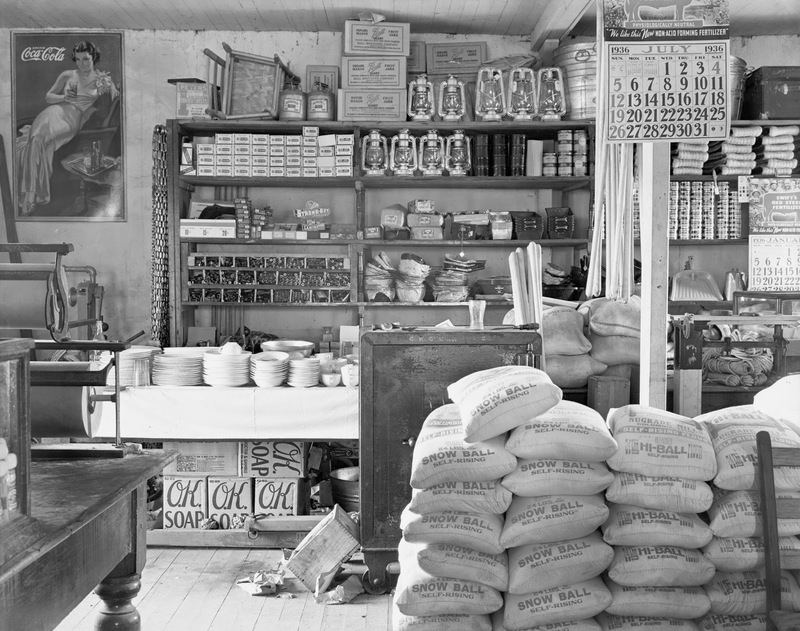 The variety of goods to be found in an old-school general store varied by what was available and what was desired by the customers. If a town was situated in an area with abundant supplies of fruit, you probably wouldn't find fruit in the general store (although you might find preserves and jams/jellies, as well as jars and lids, for storing fruit over the winter). No refrigeration meant no fresh milk, but cheeses and salted butter were there. Flour, baking powder, spices, salt, and other kitchen supplies that were shipped in filled the shelves. Coffee beans and tea were a staple, as was tobacco in various forms for smoking, chewing, and other uses. 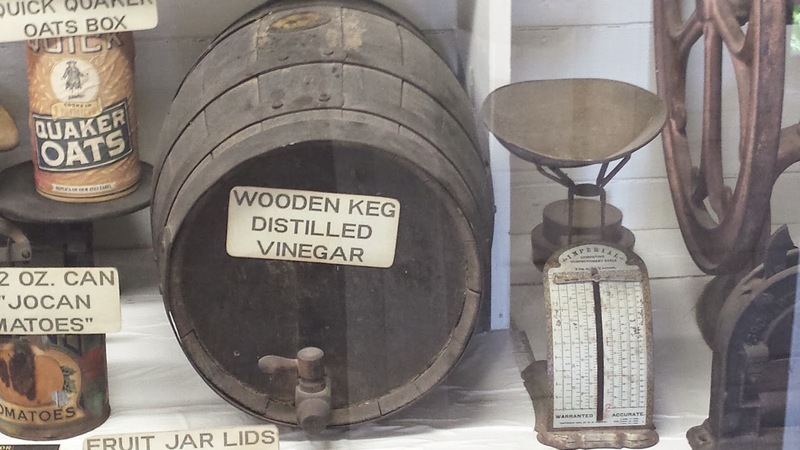 Processed or preserved food was available after the invention of tin-lined steel cans (ca. 1812), since metal cans stood up to the rigors of shipping better than glass jars. If there was no "Chemist" or Pharmacist in town, the general store would sell a wide variety of medicines like Heroin (a trademarked name for Bayer's form of morphine), Aspirin (another trademarked name), various "patent" medicines of dubious formulation and effects, and a selection of chemicals that would allow people the ability to make their own concoctions at home. Since medical facilities were rare and many diseases not well understood, treatment of most maladies consisted of numbing the pain until you either healed up or died. Life was tougher back then... and may be again. Most of their stock would be what were known as "dry goods", meaning things that were shelf-stable with a very long shelf-life: bolts of cloth, buttons, and needles for making clothes; blankets and bedding; nails and bolts shipped in wooden kegs; rope and wire; and pretty much anything else that could be bought in bulk and sold in smaller parcels for a profit. Firearms and ammunition didn't require special paperwork until 1968, so there was usually a selection of them to choose from. Pots and pans, lanterns, candles, lamp oil, soap, dishes, and just about anything else that would be needed to keep a household going could be found somewhere on a shelf or ordered from a warehouse and delivered in a few weeks (or months). Paying for purchases was a bit different in the days before credit cards. Credit existed, but at the whim of the store owner. A person's reputation determined how much credit he was eligible for, not some mysterious algorithm in a bank's computer. Personal credit was needed because very few people worked jobs that paid weekly or monthly; farmers and ranchers got paid when they sold their crops or herd, and that usually only occurred once a year. Townspeople would either pay with whatever served for money (gold, silver,or bank notes) or barter their goods and services in exchange for supplies from the store. Prices were often negotiable or variable, depending on the store owner's mood and past dealings with people. Having a virtual monopoly on the supply of some goods made it easy to charge whatever the market would allow, leading to high prices. The law of supply and demand was what determined prices in most cases. 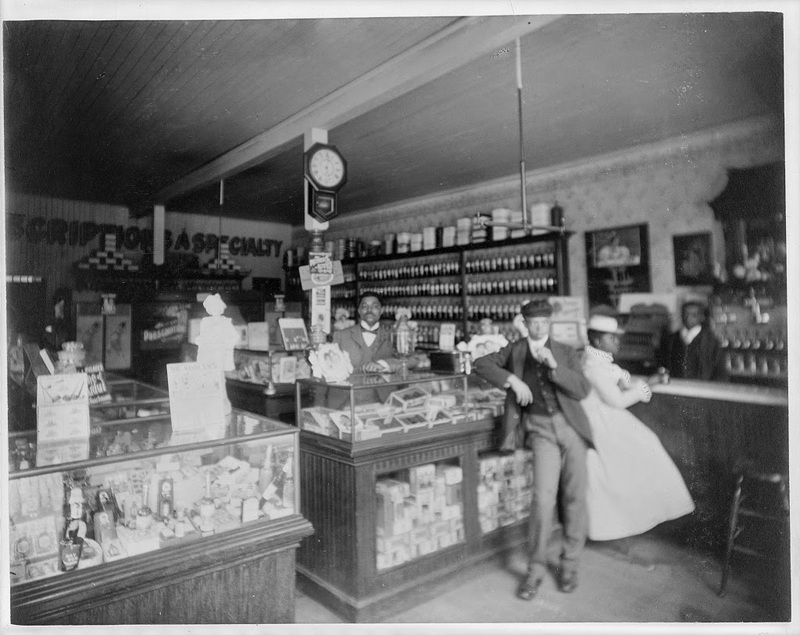 In the case of a "company town", one that is built or exists specifically to serve one company or industry, the general store was often a "company store". My mother-in-law grew up in a cotton mill company town in South Carolina. The mill owned everything- the houses, the roads, the schools, the stores, the police, and the barber shop. Literally everything in town. Purchases from the company stores and rent were deducted from a worker's wages, and that often led to virtual slavery since the prices could be raised to the point that a worker could never earn enough to pay his bills and therefore always owed the company and couldn't leave until his debt was settled. This practice has become history in most parts of the US, but it is possible that it could return. Another option (for those living outside of town) was the traveling salesman, immortalized in limericks and jokes. With a wagon, a horse or mule, and a small inventory, a person could make a meager living trading with the farmers who didn't want to travel into town. 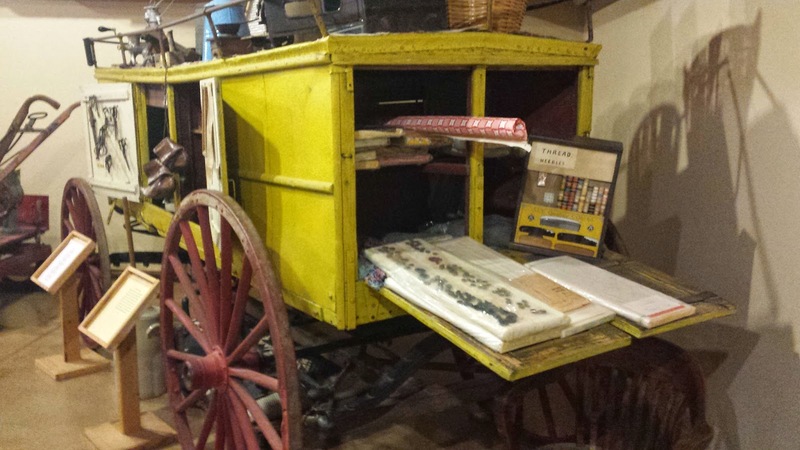 Some of the wagons, like the one in the picture, were built specifically for the trade; others were just buckboards pressed into service. Sleeping in barns and haylofts, the traveling salesman usually ate his meals with his customers when he could. The above picture is the only one of the batch taken at a local museum that actually came out usable, but you can see that the wagon has a sloped roof (covered with tin) to shed rain and snow, doors on all sides to allow access to the supplies, and a rail around the top to hold larger or bulkier items. The bright color was to make sure people saw him coming and knew to put out an extra plate for dinner and also get their trade goods in order... and possibly lock up their daughters. Being a shop owner is a tricky business. Being able to barter and give credit requires a well-developed ability to communicate and work with others. If you can "read" people pretty well, know how to keep a good set of books (accounting), and have the room to set up shop, you might be able to make it as a store owner. Knowing where to find supplies to sell and having contacts in other areas that can help find what your customers need would come in handy. Be aware, though, that other than the bank and possibly the saloon (later articles), the general store is going to have the most money/ things of value in town during the rebuilding of society. You will be the target of thieves and robbers. You will also have to build into your prices the distinct possibility that any credit you extend may not be repaid for a number of reasons: people die, crops fail, cattle are rustled. Too much of this and you'll be left with nothing but a book full of numbers.. so plan accordingly. The dust has settled and the First 72 Hours have passed. Now we concentrate on what to do in, and how to plan for, the long term via Prudent Prepping. Well, this is a bit odd for me, sharing what is going on in my non-prepping life. My friend and co-blogger Evelyn has inspired me to get a bit personal and talk about real things. My full-time job ended in August and I have been working several part-time jobs since then. Sometimes the hours I work on the shifts I get don't give me enough time to sleep much, let alone write for this blog. I made a commitment to myself, and the other authors, to write one article a week (and have it ready to be edited by Wednesday morning, since my work really needs editing!). This has not happened lately, but luckily for all of you, there have been several really great posts by very talented folks to fill my spot. The current economy in California shows some very funny contrasts: Coastal California (urban) has an unemployment rate of about 7-10%, while Central California (rural and farms) has a rate approaching 15-20%. Combined with the health care fiasco, most companies are only hiring part-time workers. Combined with the drought, high taxes and companies leaving this state, more people are looking for work than there are jobs. The jobs are there and you can get them, it just isn't fun getting them or doing some of the work. I am fortunate to have stored staples to fall back on, since my food budget has shrunk alongside my discretionary budget -- which includes all my prepping products. Rent, gas, and insurance on the vehicle are the first items paid, with everything else far down the list. This has given me a chance to reorganize my pantry items and pull out those items which are oldest, since I marked them with the actual date of purchase with a marker before they went into the boxes. This is a good example of why preps are important: I am currently in a financial disaster and it's comforting to know I won't have to choose between paying bills and going hungry. It may not be the emergency I prepared for, but that doesn't mean I can't rely on my preps to get me through these hard times! Stay tuned! There will be more reports from California -- leading the way with Bad Ideas(tm) and coming to your state soon! Have you ever had a hydration bladder that developed crimps in the tubing and prevented you from drinking out of it? If so, you don't need to replace your tube! Just follow this very simple method and you'll have your hydration bladder up and running in no time. I have now added a few clothespins to my bug-out bag specifically for this. Because I am impatient, I put mine on the dashboard of my car and let the hot Florida sun help make the plastic more malleable. If you go this route, I recommend you check on the tubing every evening to make sure it doesn't get too soft and the tube begins to crimp in the other direction. It may not be pretty, but it works, even out in the field. While I can't claim to have invented this -- someone, somewhere, must have had a similar idea -- I haven't seen it mentioned anywhere on the internet, and I came up with the idea on my own. For all of my talking, I actually don't leave the apartment that much right now. Yes, LA kind of freaks me out, and I can't carry in California, so I just tend to stay home so that I can function. Going places by myself here triggers some serious anxiety attacks, and I'd rather not lose one to three days of productivity to that. When I do go out it's always in the company of my fiance, who carries his own EDC bag. Today I'm just going to do a quick overview of what would constitute my EDC when I go out, but since I don't go out that often, I call it my OHED instead. One hat. I know, it looks a bit grimy, but I've had that particular hat for about four years now (and it was on sale at Wal*Mart for a buck). One small homemade back pack with paracord straps. This was made from material salvaged from an old and worn out pair of DR's jeans. 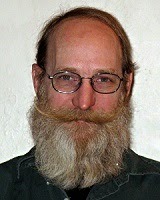 (He's one of our guest bloggers -- did the series on useful apps for your electronic devices and is also my fiance.) You won't find that particular model of pack anywhere, so I don't have a link for you. One wallet (shut up about the butterflies, it was the least girly wallet I could find for under six bucks). Normally I have enough change in it to get two people home via the bus regardless of where we might be in LA, but things have been a tad tight the past few weeks, and I've only just now had a chance to put that bus fare back into it. Several pens. People have a tendency for stealing mine. Four memo pads, in ziplock bags. Mostly because it never fails: if I don't protect whatever note taking materials I have, they always get soaked somehow, be it from water, beer, coffee or tea. There on my key ring is a paracord key fob, a small ferrous rod (gift from Tim, one of my fellow bloggers here), and a small black tube that I (normally) have 20 spare bucks in. That black knife leaning against my hat is a new addition as of today. Another gift from a good friend, it's made of ABS plastic. The scissors and hair tie are self-explanatory. Oh, and that rock. Tiger's eye. It's a bit of a Wiccan thing, as Tiger's Eye is reputed to have calming effects. This particular chunk is my pocket stone: small enough to ride around in my front pocket, and when I start getting a bit anxious, I can treat it like a worry stone. It's also big enough to hold in my right hand like a roll of a quarters if I need to start throwing punches. What? You thought that rock was only for spiritual, new agey stuff? Please! I try to multitask with my things. The latest episode of the Gun Blog Variety Cast is out! In my BCP segment I talk about the multiple uses of paracord and a great way to keep a small supply constantly on hand foot. As of 7:30 pm Eastern Daylight Time, a coronal mass ejection, produced by an X1.6 flare 2 days ago, struck the earth. The resulting geomagnetic storm is currently a G3 (strong intensity), which can cause power grid fluctuations, voltage alarms in high-latitude power systems, and possible transformer damage if the storm is of long duration. Electrical systems may require voltage correction, and false alarms may be triggered on some protection devices. However, there is a slight possibility it may rise as high as a G4, which can potentially cause "widespread voltage control problems" and "some protective systems will mistakenly trip out key assets from the grid", which could mean localized blackouts or rolling brownouts. While I do not feel we are in any danger from this, now would be a good time to check your preps. Make sure you have plenty of water on standby and that your flashlights have fresh batteries. Check the Space Weather Prediction Center for more information as the situation progresses. 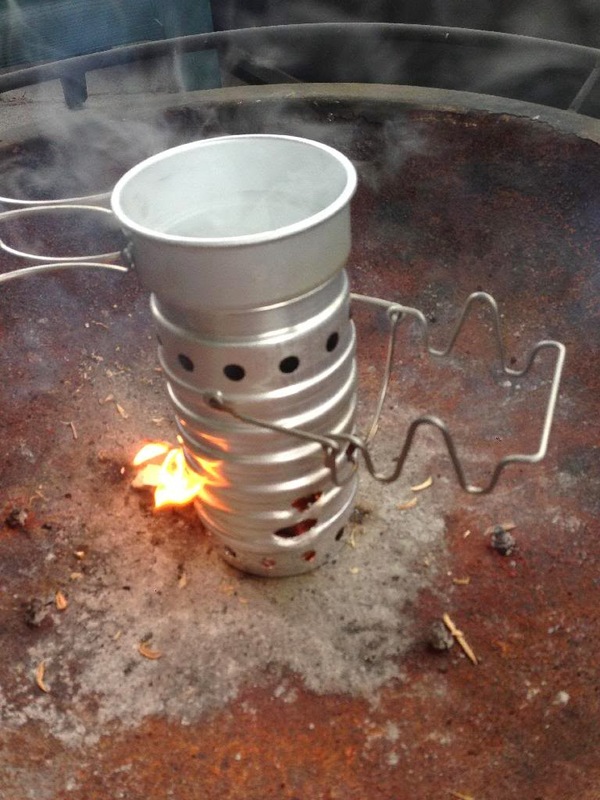 My mother recently bought a Swiss Army Volcano Stove via one of the many prepper-themed mailing lists that exists mainly to exhort folks into buying things. I don't normally condone buying anything from direct-mailers and scaremongers, but since she didn't have any kind of stove or thermos for her bug-out bag, and because she was able to buy this for $20, I didn't have too much of a problem with it. She me to test it for her, and of course I said yes. I am not very good at starting fires. This makes me exactly the right person to review these stoves. 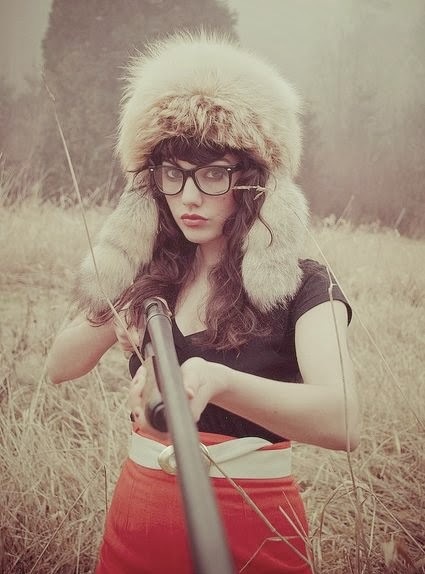 A trained survivalist can make a stove out of a cow pattie, a hole in the ground, and a mirror. I, however, am an average schlub, just like most of the people who will be using these stoves. If they'll work for me, they will certainly work for you. It is worth noting that my test methodology was slightly different than previous experiments, due to the fact that the Volcano Stove came with its own cup and water bottle. Therefore, kindly note that these are amended, non-standard tests. How quickly it could bring 16 ounces of water to boil in a steel mug the aluminum mug that came with the set. How quickly it could bring 24 32 ounces of water to boil in an uncovered aluminum pot the uncorked aluminum water bottle that came with the stove. How quickly they could cook a single egg on an aluminum skillet. Not tested as my mother doesn't have any sort of skillet in her bag (I really ought to fix that). For sake of completeness I should have tested this anyway, but as you read the review you'll see why I didn't. All tests were performed on my porch where wind would not be a factor. I used natural fuels, but since this was not a referendum on my fire-making skills, I used a lighter to start them. Now that the formalities are taken care of, let's begin. I will state from the beginning that I was predisposed towards liking this stove. It has a nice gadgety feel to it, and anyone who knows me knows that I like gadgets I particularly like how it all folds up into a thermos-sized container 10.5" tall and 3.5" diameter. 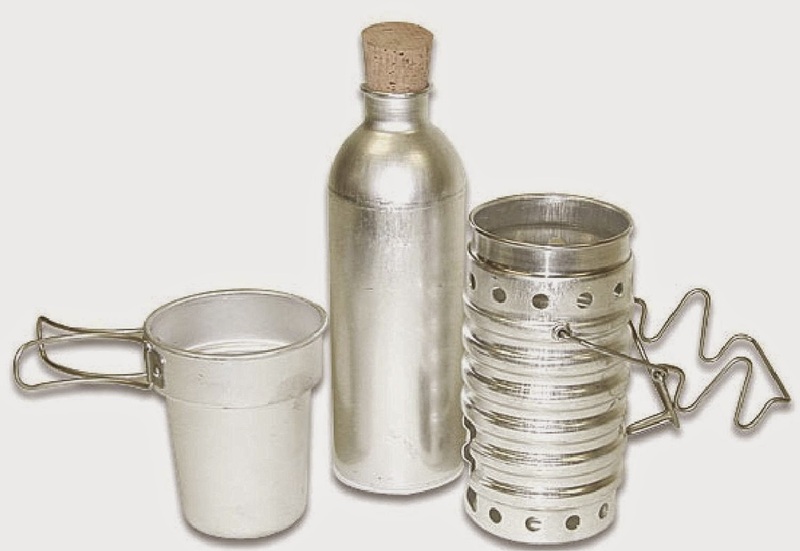 Made out of aluminum, it has an empty weight of 13 ounces; if you fill the bottle with water, that weight goes up to 45 ounces (2.8 pounds). My biggest concern with this stove was that it's made of aluminum, which is not particularly sturdy, and there are some concerns that cooking food in aluminum causes the AL to leach out into the food and contribute to health problems. Fortunately, my stove did not melt or develop burn-through holes during the course of these tests. As I mentioned earlier, this was not a referendum on my fire-starting skills, so I cheated and used a lighter. Even then, I found it awkward to light the tinder through the 1.5" x 2' opening. I'm not sure how I would have lit it had I needed to use ferro rod, especially given the ratio of small base to height. If you do plan to light it with sparks, my suggestion is to place a heavy rock behind it so that, if you bump the stove while trying to light it, you don't knock it over. Once I got it started, though, I was surprised at how well the stove kept a fire going. I expected to have problems with it, but all I needed to do was keep feeding sticks through the opening and it burned merrily along. It's a very efficient design that isn't particularly fuel-hungry, and the fuel door is just large enough to make feeding it easy without losing a lot of heat. There is a continuing theme of "I was afraid it would fall over" throughout all these tests. As you can see from the picture, the cup is smaller on the bottom than it is on the top, and with the extended handles shifting the center of gravity, it fell over more than a few times when empty. Fortunately, adding water to it helps stabilize it: 2 ounces turns it into a 50/50 proposition, and 4 ounces weighs it down enough to not tip over unless it's bumped hard. If it does fall, it will fall in the direction of the handles, so position your cup accordingly. The reason for the cup being smaller on the bottom is so that it will fit inside the stove without restricting airflow out of the holes around the upper ring. I found this quite ingenious and most effective: 16 ounces of water began to bubble at 2 minutes 30 seconds, with a light boil occurring at 6:30 and a nice rolling boil at the 8 minute mark. The handles were quite warm to the touch afterwards, so I recommend you pack a kevlar glove or two into your bug-out bag. After having a good experience with the cup, I expected similar from the bottle. I was disappointed. Here's the problem: the cup has an extra inch of clearance over the fire than the bottle does (there's a little tab on the handle that fits into a slot on the side and provides the bottle a bit of a ledge to rest on), and while the cup is only 2.625 inches across where it meets the fire, the bottle is 3 inches in diameter. These two factors served to choke off the fire when I was attempting to boil the bottle and made the design suddenly inefficient. After 8 minutes of struggling to keep the fire going, it eventually went out (due to lack of oxygen) without causing so much as a bubble to rise. What we have with this bottle is a relatively large volume of water for a camp stove to boil, combined with a very small surface area with which to heat it. I'm no engineer, but this strikes me as inefficient. Fortunately, my Solo is quite efficient, and within 4 minutes I started to see some bubbles making their way to the surface. At only 3 inches across, the bottle just barely fit on all three prongs of the Solo's cooking ring. Compare this to my stainless steel camp mug, which is 3.5" across and not nearly as tall. Short base, tall cylinder, precariously balanced... you know what's going to happen, right? At the 9 minute mark, while adding more fuel to the stove, I bumped the bottle just enough to have it fall over -- TOWARDS ME, I might add -- and spill its contents everywhere. It's a good thing it wasn't boiling, or I could have scalded my legs and feet. Fortunately, I escaped with just some reddened skin and a few scrapes from scrambling out of the way. It never even occurred to me to test the other stove again with the egg and frying pan. Given how well the Volcano stove works when the opening isn't restricted, I imagine it will work quite well, but I have no hard numbers for it. It's not a bad little system at all, especially if you can get it for $20 like mom did (I see it retailing for between $40 and $50, which is just far too much in my opinion). I like that there's a water bottle built into the system, but I'm worried that the cork stopper would keep the bottle from leaking all over your pack if you set it down on its side. The biggest drawback of this system, of course, is its complete inability to use the bottle for cooking -- your best bet is to use the bottle for water storage only, and any water that needs to be boiled should be done only with the cup. Now, that's great if you have a source of clean water nearby -- you can eat or drink straight from the cup. However, if you're having to purify potentially contaminated water, you can't use the cup for dinner without the risk of contamination. If you just want a drink of water, no problem, just drink from the bottle, but heaven help you if you want some hot soup for supper! If you do, you'd better have a clean cup... in which case you're probably just better off bringing a different stove and a water bottle that you can also boil. Great stove, good cup, crappy bottle. While entire books have been written and movies have been filmed about stagecoaches and the people in them, and everybody knows the name Wells Fargo, have you ever thought about what exactly the role of a stage line played in the mid to late 1800's America? Remember that this was a time when most of the threats of highwaymen and attacks by indigenous tribes, while in decline, were not yet gone. Even today we have carjacking and robbery of trucks carrying goods. Long before everyone drove cars, before paved roads, and even before the railroads served more than the major cities, there was a need to transport goods and people from town to town. The average farmer/rancher/cowboy had a horse available to take trips, and maybe even a buckboard wagon or surrey if they were rich enough. Townspeople and businessmen generally didn't have the time or resources available to care for a horse and/or wagon that wasn't part of their daily work (those that could afford it used a livery stable -- a subject for a future article). The Pony Express, despite all of the myths surrounding it, only ran for 18 months in 1860-61. The US Post Office used trains to move large quantities of mail between large cities, and stagecoaches to distribute it out to smaller towns. Freight was delivered by wagons from the company that sold it, or by freight companies hired for the job. 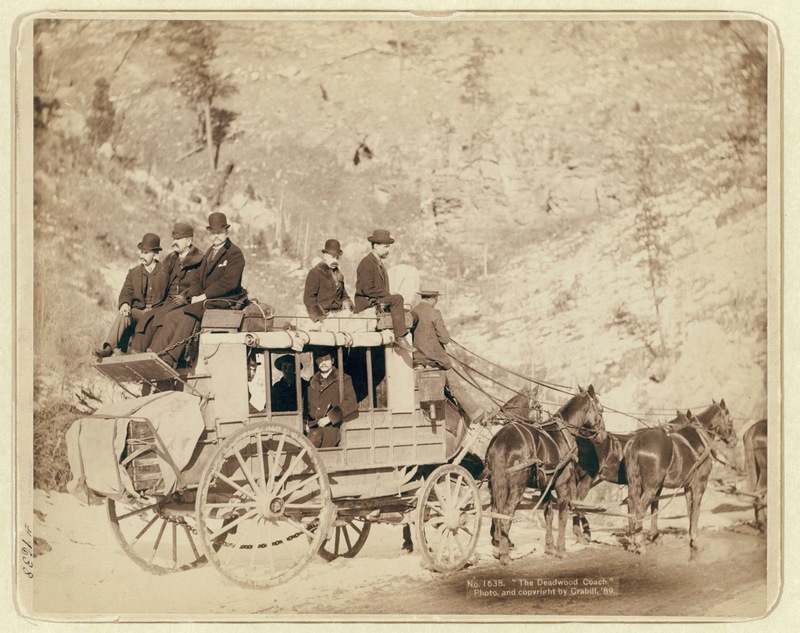 If you lived and worked in a town or were traveling more than a day's horse ride from home and needed to go to another town, you probably took the stagecoach. The name “stagecoach” comes from the fact that the “coach”, a well-sprung covered wagon, traveled a set route in “stages” between stations. The stage line stations were spaced as far apart as a set of horses (or mules) could safely drag a coach. The stations were a place for the drivers to switch out the horses, and let the passengers out to stretch their legs for a bit and take a bathroom break, before continuing the journey. Not all stations were in towns, but the ones that were would either provide lodging for overnight stays, or would be close to a hotel that could do so, if travel at night was not safe. The main job of the station master was to make sure that a fresh set of horses was available for the coaches when they came in, with minor maintenance of the coaches and maybe feeding the passengers as a side job. Depending on the financial health of the line, a spare coach may have been available at a station to cover break-downs. The coach itself evolved little over the 200 years or so that they were in common use. The passengers rode inside a covered wagon while the driver and guard, who usually carried a "coach gun" and gave us the phrase "riding shotgun", rode on top. There was often a rear facing seat on the top for "steerage" class travel or extra guards. Luggage and freight was stowed on top and at the rear of the coach to make best use of the interior space. Between two and six horses would be hitched together to pull the coach, the number determined by the size of the coach and the speed of travel. Unsprung wagons with rigid wheels were limited to about 3 MPH before they started to shake themselves and their passengers to pieces, whereas the use of leather suspension or steel springs allowed a coach to travel at 10-12 MPH. The leather suspension style involved a frame attached to the axles with the cabin of the coach sitting on wide leather straps strung across the frame. This imparted more of a swaying motion to the ride rather than the up and down motion that you'd experience from springs. Steel bands on the wooden wheels made the wheels last longer on rough terrain and lightened the wheels themselves by requiring less wood to hold their shape. Doors and windows were accessories added as the weather demanded. Stage lines were private companies set up in towns and cities to provide a way to move people and small freight with some security. The "strongbox", a portable safe with the keys being held at the stations, was a common feature on stagecoaches and provided a secure way to ship small valuables. The closest we have to the stage lines today would be Greyhound bus terminals and routes, and they've lost a lot of business in the last few decades. UPS and FedEx have taken over some of the small freight business, and private couriers still have a place in commerce. After TEOTWAWKI, there may be a call for the resurrection of stage lines to connect towns and cities again. Since the operation of a stage line requires staff, equipment, horses or mules, and several separate places of business, this is a job for someone who has a lot of experience in management. The old saying about a chain being as strong as its weakest link comes to mind, and anyone who wants give it a try had better be ready for headaches. Security will be a major concern, and the level of unrest and random violence in your area will need to be addressed before any form of travel is planned. All pictures are public domain or my original works. 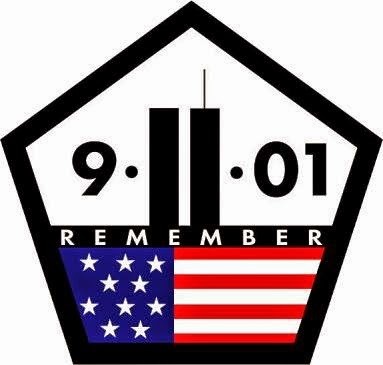 Thirteen years ago today, our nation experienced its greatest tragedy in generations. For many, it was a wake-up call to become prepared for disaster. While no amount of personal preparation will prevent a terrorist attack, it is by making preparations for worst-case scenarios that we engage and sharpen our most important tool: our minds. As you go about your day, be thankful for those who have gone before you, and say a prayer for the lost. 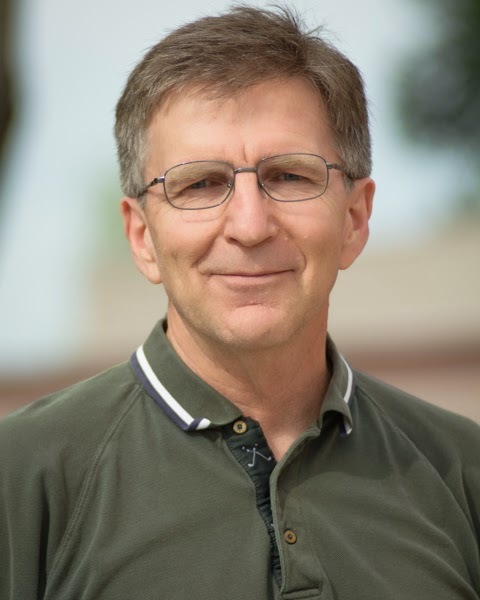 DZ, today's guest author, is a former Action Guy turned private investigator and bounty hunter who, in his own words, "isn't nearly as cool as he used to be." Part 2 of this series may be found here. First of all, my apologies for the long delay from part 2 to part 3 of this. I got caught up in all sorts of work stuff and let it slide. Many thanks to David Blackard, who provided his recommendations for iPhone apps. For simplicity's sake I've cut and pasted some of his comments with minor editing for flow, which I guess makes this a joint article. As with the Android post, I've focused on free apps. If you know of a paid app that could replace any of what I mention here, and is worth the price, feel free to extol its virtues in comments. Also, if you've used the paid version of any of the free aps I mention here, please do mention it, or message me and I'll update the article. The great thing about the free ones, though, is you can have multiple apps for the same general function and use whichever one you like for what you're doing. There's not much to most compass apps. Some may be prettier than others, and maybe you prefer that or maybe you want something a little more stripped-down for simplicity of use. Keep in mind that a lot of other apps use the compass in the phone, so depending on what you want to use it for, you may not even want a dedicated compass app. Also keep in mind that you should still have a real compass and use it to calibrate the electronic one from time to time. I, for one, would not trust an electronic compass, tiny and surrounded by metal as it is, to remain calibrated under rough use. The iPhone has a standard compass app that was not very useable until a recent update. Since then, you no longer have to wave the phone in a Figure 8 to reset or activate the compass, just open the app and 'roll' the needle around the dial in a circle. There's not really anything that you'd call a GPS app, just apps (usually maps) that use the GPS function. All that are applicable are covered in their respective sections. The choice of mapping apps that save maps for online use is huge, but most of them are oriented to street maps. One good option is All Trails, which has the ability to find local trails, log (GPS) where you went and then share your trip. The newest version has been improved by adding better descriptions. 5,000 of the country's most popular trails are listed, BUT if you have a favorite not found, hike it, plot it and send it in to be added! A paid ($2.99) option: Pocket Earth This off-line map app covers the world (almost) with GPS and maps. I have no info for foreign use, but western US maps work very well. Allows active marking of routes, but battery life will be short if GPS is left running in the background. Certainly your device came with a camera app already installed. I promise you that's good enough for most things you'd ever want to use it for. But if you must try others, just look around. As I type, Apple have just announced the iPhone 6, which finally includes an NFC reader. The phone will be released in September 16, so if you get one and try some of the NFC apps that are feverishly being written now, please let us know which are worth getting. Traditional games such as solitaire, chess, and checkers are all free, and here are some other games that will keep working after the grid goes down. Go find some you like and install them. 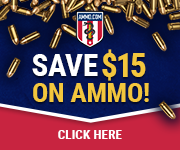 They'll help keep you sane after SHTF. Every Kindle book can be downloaded to your phone with this app. Many preparedness-oriented books, manuals,and pamphlets are also available as PDF files that can also be saved and read offline later by the Kindle app or others such as WPS Office. Beware! Keep your Kindle app updated. Otherwise, if they release an update just before SHTF and you don't have it, your app may stop working. You can also use the iBooks app. The new iPhone has also just added a pressure sensor, so as with NFC, let us know what apps work for you when they come out. Yes, you'll need to have a way to charge your phone, be it solar or manual (or off a generator if you have one), but the vast majority of the battery usage is in the various radios in a smartphone or tablet. Put it on airplane mode and it'll last much longer.